Ah, Valentine's Day. Time for romance, chocolates and all sorts of unspeakable undead beasts—you know, the real reason for the season. ...Okay, sure. Maybe getting a little monstrous isn't the way you traditionally spend your Valentine's Days, but monster love stories are probably a lot more romantic than you'd really expect. Than anyone would expect, really. 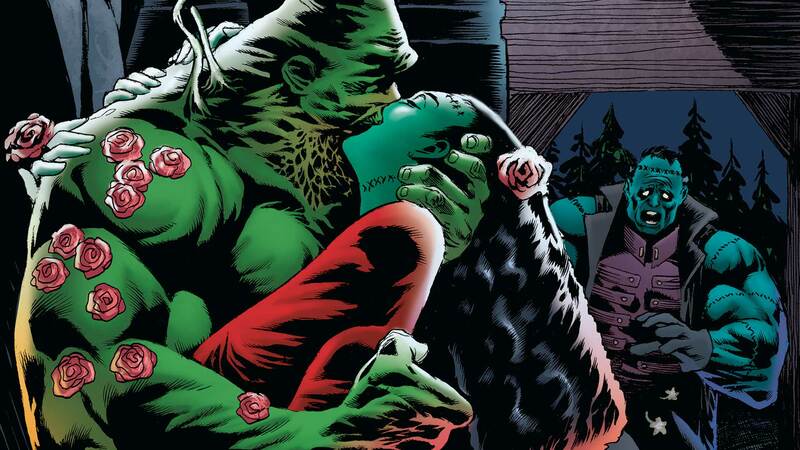 So it’s a good thing that there's a whole anthology of monster love stories now available to change minds, win hearts and prove once and for all that Swamp Thing may be the most swoon-worthy aquatic monster since…well, that other swoon-worthy aquatic monster now taking moviegoers by storm. YOUNG MONSTERS IN LOVE #1, in comic shops worldwide, celebrates off-kilter stories of love and loss that just so happen to star the DC Universe's most monstrous denizens, from names you'll recognize easily like Frankenstein, Deadman and Man-Bat to ones that might be a little less familiar, like Monsieur Mallah and the Brain. But no matter who (or what) the stories are actually about, there's the bigger question of why these stories need to be told in the first place. Why monsters? Why romance? What makes these stories worth telling? The truth of the matter is, even outside of the DCU, stories about monsters falling in love have been a pretty massive rung of the whole romance genre for centuries, dating all the way back to the days of antiquity and mythology. But you don't need to be a historian to appreciate the appeal, especially if you're a comic book fan. Superheroes prime us to understand and empathize with stories about people who don't quite fit into society the way that they maybe need or want to. Even heroes as joyful and as optimistic as Superman have their moments of feeling like they don't belong. That's a good thing! I love Clark as much as the next person, but it would be pretty tricky to read about him every week if he were just completely happy and content with his life every single day, you know? That's really the fundamental appeal of the monster story too, just made a little more literal. Monsters often don't have the luxury of passing themselves off as "normal" the way that Clark Kent or Diana Prince do. They don't get to blend in as easily, and they never get to put what makes them different in the back seat when it's most convenient or necessary. People (creatures?) like Swamp Thing or Frankenstein are stuck with themselves the same way we're all stuck with ourselves. Okay, sure, maybe we're not giant green plant elementals or reanimated cadavers, but I'm sure you can relate to the idea of waking up in the morning and feeling like you just can't get your "disguise" to look right. Like suddenly, putting on your glasses doesn't transform you from Superman back into Clark Kent, and instead leaves you in some weird, uncomfortable middle ground. But the thing we need to remember is that being stuck in that middle ground doesn't make you any less you, and it's the same for fictional monsters. Sure, they might have gone through something horrible to make them the way that they are, or maybe they've never known what it's like to be "normal," but that doesn't make them any less susceptible to needs and wants and all that other quintessentially human baggage. That's the real reason it becomes so satisfying to read about monsters falling in love, or struggling with relationships, platonic or otherwise. Those monsters and relationships let us explore and dig into the blurry, uncomfortable, liminal spaces in ourselves. These stories aren't always happy, but they're not always sad. Sometimes the risk of heartbreak is what makes the whole endeavor really worthwhile, right? After all, these stories aren't meant to be easy, they're meant to be honest and true in a way that other stories can't, and being a monster can be hard, complicated, unforgiving work. But it can also be kind of beautiful. So, settle back, maybe dim the lights a little bit, and let yourself remove your human disguise as you relax with Young Monsters in Love today or any day this month. You might meet some new characters or reconnect with some old favorites, and rest assured, none of them are going to judge you for not quite passing as normal. YOUNG MONSTERS IN LOVE #1 by Tim Seeley, Mark Russell, Steve Orlando, Bryan Hitch, Kelley Jones, Frazer Irving and more is now available in print and as a digital download. Meg Downey writes about the DC Universe for DCComics.com and covers Legends of Tomorrow for the #DCTV Couch Club. Look for her on Twitter at @rustypolished.